Home Archive for category "Podcast"
I’ve discovered a fairly new podcast, 21st Century Creative, by the British “creative entrepreneur” Mark McGuinness. There are just 10 episodes online so far, and I am blazing through them. Between breakfast and sitting down to my desk this morning, as I quickly scrubbed the walls behind the old refrigerator in preparation for the new one that arrives tomorrow, I listened to the episode Designing a Global Small Business with guest Laurie Millotte. She spoke about how she runs her successful design business while traveling the world, and the challenges and many rewards of such a life. So much more interesting than scrubbing a wall (although I’m sure she sometimes does the equivalent; successful creative people, like everybody else, do whatever needs to get done) and so inspiring. On a round-the-world trip, Laurie spent time in Vietnam, Thailand, Japan, Hawaii, Mexico and other countries. And not only did she manage to keep running her existing design business from her laptop, she designed and created an entirely new business – Outshinery. Outshinery takes a new approach to product photography for the wine and beer industries, using 3D digital technology to create images without the hassle of shipping bottles of alcoholic liquid to photographers’ studios. It means they can deliver ‘bottle shots before the wine is bottled’. The Outshinery team are spread across 3 continents and 4 office spaces, but use technology and teamwork to get things done together. If you’re curious about the idea of combining exotic travel with your creative work, or if you’re a creative service provider who would like to have more income and impact without having to work longer and longer hours, you’ll find this an eye-opening and inspiring conversation. I’ve submitted freelance work from a friend’s family’s 16th-century villa in Florence, from New York City while attending the American Society of Journalists and Authors conference, from a trampoline park in Seattle, a row house in London and various airports and airplanes. But this woman definitely wins. I am definitely one to combine travel with my creative work, though right now I’m hunkered down because of my child’s school schedule. But we go when we can. 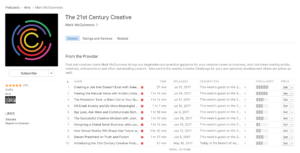 McGuinness is now working on Season Two of his creativity podcast. He says he’s open to suggestions for topics, by the way. I can’t wait to hear what he comes up with.